Look around the modern office workplace and what do you see? Probably computers with post it notes and amidst them, one business tool that has stood the test of time in being pen-stained with ideas – whiteboards. Although whiteboards remain a mainstay for businesses today, they are still analogue. If only there was a clever solution to write, present, save and share ideas in a more efficient and engaging manner? 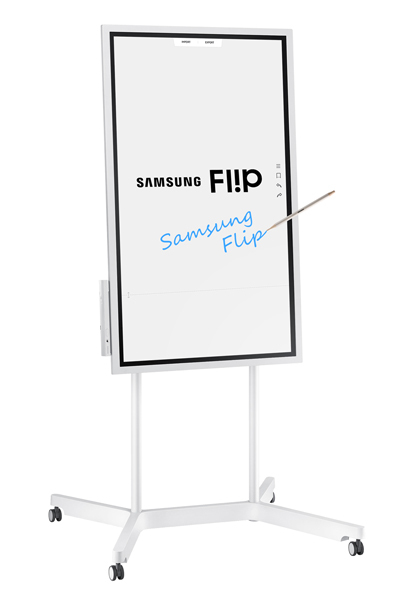 Enter Samsung Flip, Samsung’s digital flip chart that transforms the modern meeting with new interactive and more collaborative digital engagement. By reducing the challenges faced when organising, facilitating and recapping meeting notes, Samsung is committed to keeping the paperless dream alive with its vision of a “Workplace of the Future”, believing that workplaces will now have an environment that nurtures high productivity and creativity results. “In today’s day and age, many companies are embracing open-plan office environments where meetings are more likely to occur spontaneously rather than in meeting rooms. 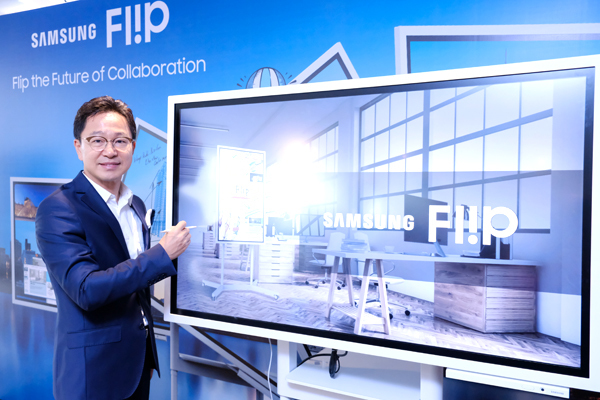 With this in mind, we are introducing the Samsung Flip to take digital collaboration to a new level with superior mobility and usability features that foster a creative, collaborative and productive business environment. 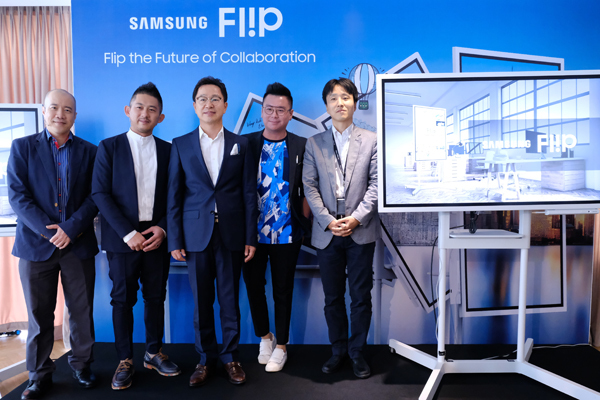 Endless workplace possibilities will now be at the tip of your fingers, anytime and anywhere, and we look forward to continue helping businesses work smarter and more efficiently,” said Yoonsoo Kim, President, Samsung Malaysia Electronics. An upgrade on both standard paper flip charts and analogue boards, the Samsung Flip display expands opportunities to generate game-changing ideas while maintaining the familiar feel of traditional writing. Additionally, the Flip’s portable, wheel-based stand transforms any location into a meeting workspace, giving businesses with limited conference spaces some added flexibility. Through simultaneous multi-user engagement, Samsung Flip ensures that all voices and ideas are heard during brainstorm meetings. Up to four different participants can introduce content or annotate directly on screen at the same time using either their fingers or a dual-sided pen. In doing so, users can customise their own writing style, size and colour, with each notation made clear and visible through a viewer-friendly 55-inch UHD display. For added interactivity, the Samsung Flip display offers extensive device compatibility through PC, mobile ports, and both wireless connectivity and USB. An integrated screen-sharing functionality makes Flip content available on connected PCs, smartphones and tablets without interruption or reduced visual quality. Likewise, users can import personally-stored content onto the Flip display’s screen and introduce fresh ideas to the discussion. The Samsung Flip display delivers unprecedented collaboration efficiency by condensing the multiple tools and processes required for a traditional meeting into a sleek, stylish all-in-one design. Participants do not need a specialised touch pen to interact with the screen, and can erase notes through a quick palm swipe. Flip users also can access up to 20 pages of writing space, with embedded search functionalities available to instantly direct participants to specific content. This continuous, rolling stream avoids the lost time and interruptions that often result as participants have to search through multiple sheets of paper or lines of notes to locate a specific detail. Each Flip display is customisable and can configure to portrait or landscape orientations to suit unique meeting needs. When coupled with its height-adjustable stand, the Flip maximizes available writing space at users’ preferred positions. Should a meeting require more a centralised and roundtable-style discussion, users can opt to remove and connect the Flip display to a compatible wall mount. 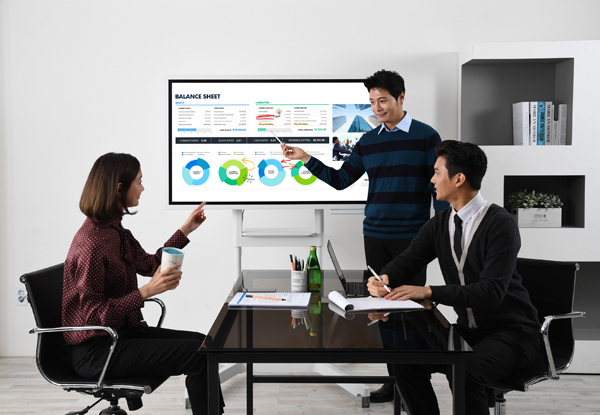 As meetings wrap up, the Samsung Flip display securely stores all content within a central database, eliminating the need for cumbersome recaps or handwritten transcription. An airtight, password-based protection system safeguards meeting details and ensures that only approved users can access the information. Once logged in, meeting facilitators and participants can download and share featured content through email or traditional printing. Users additionally can save meeting notes into a USB drive or other external sources. 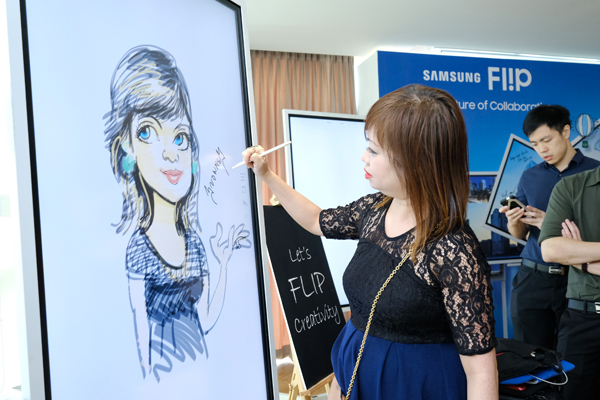 The Samsung Flip is now available in Malaysia at a recommended retail price of RM12,999. To find out more about Samsung’s business productivity and collaborative tool, please visit here or contact the hotline service at 1800-88-9883.